Cancellation policy: 72 hours before arrival. Failure to cancel within this time or in case of no show will result in a cancellation charge equal to the first night of your stay. For group bookings we ask for a deposit equal to the first night of your group reservation. Hello there, travellers! 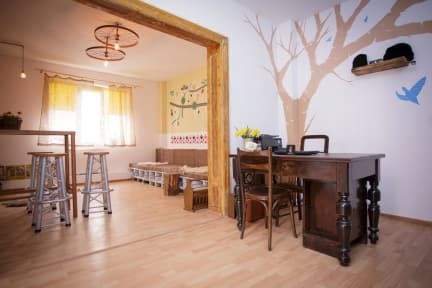 People say that we are a nice, homey and friendly hostel in the center of Bucharest. We think they can’t say it better. Not too big, not too small, we accommodate just the right amount of people to keep this home-like vibe. And so it happens that most of the times guests end up being our friends. Sometimes they leave just to come back, other times they just want to stay more. Sometimes we drink pălinca (the traditional “fuel for the soul”) and end up sleeping on the huge beanbag from the living room, other times we just chill, and chill, and talk about all the wonders of the world. The great thing is that you never know what’s going to happen today because there are always fun and nice people around with ideas and initiative. And not to forget the warm & welcoming smile of our super-amazing-awesome-friendly staff you will see first thing you enter the door. This is the second time I've been here and the friendly, relaxed atmosphere is the same as I remembered. Comfortable hostel, friendly and helpful staff and easy to navigate to the main shopping district. Awesome hostel with great staff and an excellent atmosphere. One of the best hostels I've stayed in during my trip! Will be back! I will come back for sure, this place feels like home. A colourful maze in a historical building. Friendly staff and well-equipped kitchen, clean rooms, spacious bunk beds, free lockers. Downside: no wifi in the evening. Only stayed for one night but wish I could have been longer. Friendly staff, great chilled atmosphere. Location is very good, in a quirky building and bed was comfy. Good kitchen facilities. The 4 bed dorm is right by the kitchen area so can be noisey if you're not a good sleeper. Would definitely stay again. Staff are friendly here and welcoming. Required to take off shoes on entry but hostel doesn't feel the cleanest. Only a couple of showers for entire hostel and these are downstairs so if your room is upstairs this isn't good. No toilet paper down toilets which is a bit smelly. Fully equipped kitchen, nice common room, dining and smoking areas. Atmosphere is pretty decent and location is good too with 10 min walk to old town. Shop close also. Been in many worse hostels. it was nice they give you a locker with your own key. i found the area not clean and the kitchen not an area to be usable. i was also bitten by bed bites while staying here.